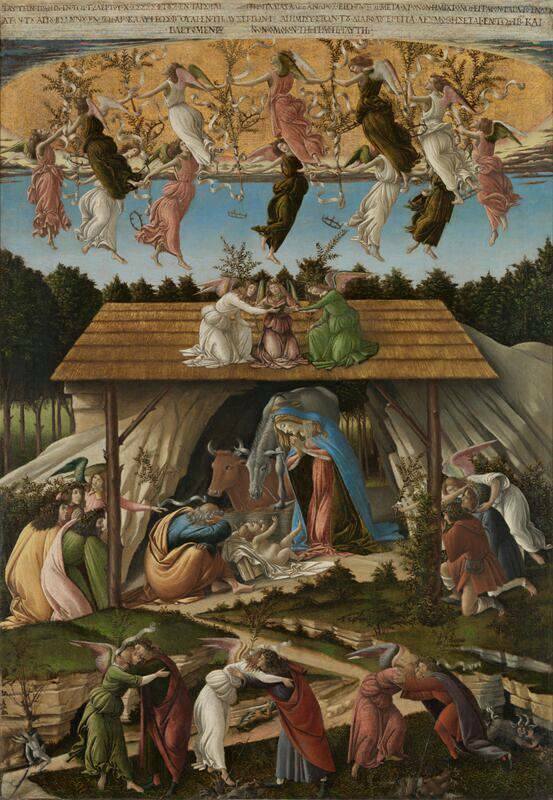 I hope you've enjoyed this collection of adoration of the Shepherds paintings (except for the one irresistible image of Mary reading in bed). Did you notice how many of them --even as they depict happy haste, joy, adoration-- contain references to the Passion as well? The following does not follow the pattern of quoting from a papal homily, but it quotes from a papal homily, and is a beautiful reflection on this connection between the cradle and the cross, so I'm including it. Read the whole thing, as I thought it would be cheating to include the best part, the conclusion, in a pull quote. Coming to: without doubt an infant’s smile is a joy shared with another person and inherently social. It makes a demand on us to respond with joy in a like smile – and we do. This transcendence-in-immanence, which the Jewish philosopher Emmanuel Levinas recognized in the human face, is seen first in a baby’s smile. Imagine then the smile of the infant Christ, expressing joy that a God-man has come into the world. Since “there is a direct thread joining the manger and the cross,” as Pope Francis said in his Christmas homily, this word on the cross connects to Bethlehem too. Through Mary’s eyes. Good disciple that she was, she may have remembered her son’s teaching and looked up at the Cross as a kind of childbirth.